How hard is it to solve a murder? I’m guessing that unless you have a lot of fake science (I’m looking at you CSI, Zoom! Enhance! ), it’s most likely not an easy task. Today we are going to be looking at a new offering from Z-Man Games called Dark Stories. 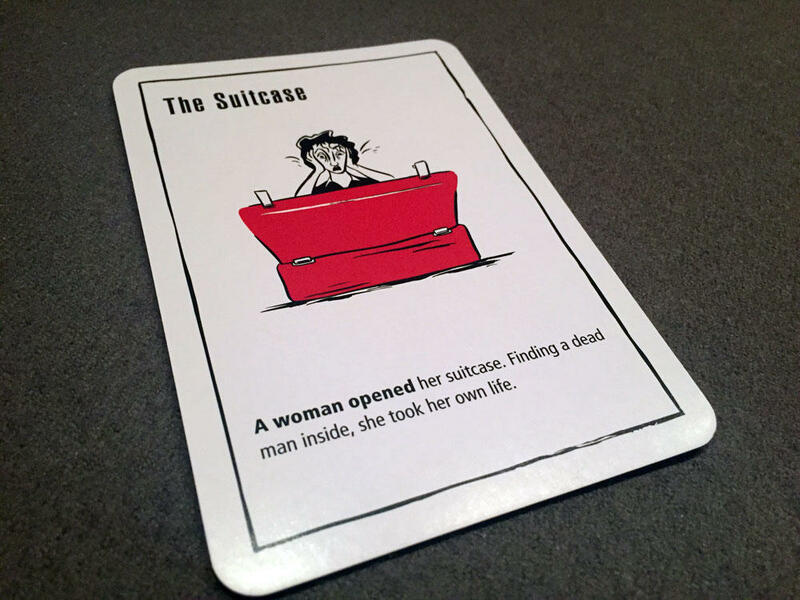 This pack of cards tasks players with figuring out how a person died; be it from a freak accident or murder most foul. What makes it difficult is that the players have very little to go on in the way of clues. Dark Stories is a small box with minimal components, does that mean small enjoyment? It’s time to find out. Dark Stories is a deduction game for any number of players that will play for as long as you want. In Dark Stories, one player is the game master who will read a scenario to the other players. The scenario almost always involves someone dying in an unusual way. The rest of the players must then try and deduce the specific scenario as to how the person died, by asking a series of yes/no questions. The components in Dark Stories are limited to a box of 50 oversized cards. Dark Stories comes in a small, travel friendly box and contains 50 oversized cards. Each card is double sided and with a small amount of text on each side, along with a black and red illustration. 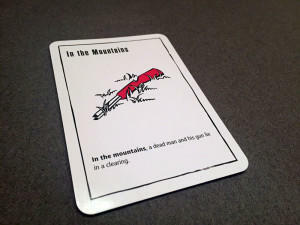 The text on the front presents the scenario, while the text on the back of the card explains the details of the person’s death that the other players must figure out. 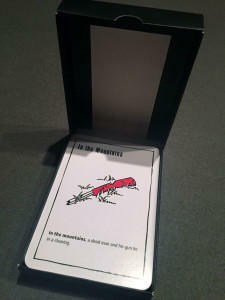 The cards themselves are larger than your standard playing card and printed on a nice quality cards stock. Playing Dark Stories is about as easy as it can get. One player, the game master, draws a card and reads the text on the front to the other players. The game master then secretly reads the solution on the back. Once ready, the other players may ask the game master any number of yes or no questions. The game master can answer, yes, no, or irrelevant if the question might lead the players down a wrong path. If the players ask a question that can’t be answered yes or no, the game master should inform them that they need to rephrase it. There is no limit to the number of questions, or the amount of time the players have to deduce the solution. The mystery is considered solved once the other players figure out the specific situation of the person’s death. Or at least get fairly close to it. Once solved, a new game master is chosen and the next mystery is drawn and read aloud. Players can play for as long as they like, as no score is kept and there is no set endpoint in the game. 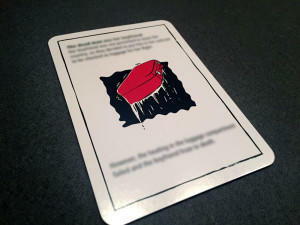 Each mystery card contains a brief statement and a red and black illustration. The reverse side contains the solution. As someone who loves puzzles and solving riddles, Dark Stories fell right in my wheelhouse. I love the feeling that comes when you make a breakthrough when trying to solve a riddle, especially after being stuck for a while. And with Dark Stories, you will definitely need to use your creativity to figure out the answer. This is especially true with some of the more…creative mysteries. While some of these riddles were interesting and fun to solve, others were definitely maddeningly frustrating. I’m going to try not to give too many spoilers in this review, but suffice to say, some of these cards will have you shaking your head at their absurdity. Be prepared to think outside the box with Dark Stories. While some riddles were definitely clever, with others, there was an audible groan when the solution was finally read. The solutions can sometimes be quite silly. This one has been blurred out to avoid spoilers. Dark Stories is a pretty unique game to play. So much so that I’m having a hard time actually calling this a game. To me, it’s more an activity. That’s not a knock against it; I just think people need to be aware of what they are getting. There is no endpoint, winners, losers or scores. So for me, it makes it hard to classify this as a game. Some games in the past have straddled this line pretty closely (Concept), but Dark Stories is the first I’ve played that I truly felt it was more of an activity. But as an activity, it can work pretty well. One place it’s worked fantastic for us is in the car. A group of us had a 2 hour card ride and we pulled out Dark Stories to play during the trip. As there is no board or pieces, and everything is verbal, even the driver could join in the fun. This helped pass the time quickly and gave us something to do. Dark Stories also works well in just about any social setting where people are just hanging out. I could easily see this being played around a camp fire or at a backyard barbecue. Literally anyone can play it with almost no prep work or explanation of how to play. I’ve found that the “gameplay” itself can range from very clever to off-putting. It really depends on how much you enjoy lateral thinking and puzzle solving. Some people wanted nothing more to do with Dark Stories after a few of their wackier cards, while others enjoyed trying to wrap their head around these mysteries. It all comes down to your personal preference for riddles and how creative you can get. That being said, it’s definitely not a game I’d play with young kids. Many of the cards are gruesome, with all of them being related to death in some way. The mysteries in Dark Stories range from really clever to maddeningly absurd. Despite some of the wacky cards, I still had fun playing Dark Stories. At the right moments, it’s a great thing to have on hand. As only a small deck of 50 cards, it’s highly portable, and you can quickly pull it out when you have some time to kill. In the end though, I’d still classify this as more of an activity than a game. With that in mind, I’m going to skip giving it a numerical rating like we usually do at the end of a review. As an activity, I’m not sure how I’d rate it on our gaming scale, or if it’s even necessary. You should be able to tell from this quick review whether you think this game would be for you or not. To that end, if you are looking for something that supremely accessible, highly portable, and socially interactive, then Dark Stories is worth having on hand for those moments when you have time to kill, but can’t play a traditional game (see my car example above). If you are looking for a game with winners and losers, or are easily frustrated by the absurd, then Dark Stories is definitely not for you. While Dark Stories won’t have a ton of replay value with the same group, it’s low price point help make it an easy impulse buy. It’s a good thing to have on hand when the opportune time to play arrives. 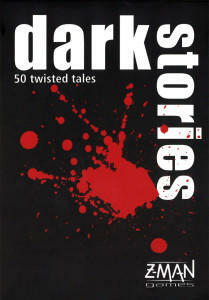 If you’d like to pick up a copy of Dark Stories, you can get it for about $10.